Last week there was a wonderful night out at the New York Irish Center in Long Island City, with another capacity turnout for a great night of storytelling, music and charity. It certainly was a sterling example of what a brilliant Irish community center that place on Jackson Avenue has become when it welcomed two visiting musicians from Ireland in Oliver O’Connell from Clare and Mickey Dunne from Limerick who were on a one-week tour with stops in Virginia, Massachusetts and New York. The predominant theme for their multi-media presentation was on the importance of the traveler community in helping to disseminate and promote traditional Irish music throughout Ireland in the last century especially. Families like the Dorans, Fureys, Keenans and the Dunnes played prominent roles as researched in a book called Free Spirits: Irish Travelers and Irish Traditional Music, co-authored by O’Connell drawing out of the successful of the Johnny Doran Tionol in Clare in recent years. O’Connell proved a very dynamic Fear A Ti and performer all night with his box playing, singing and light-hearted stories that told lovingly of days long ago in his native Clare around Doolin. 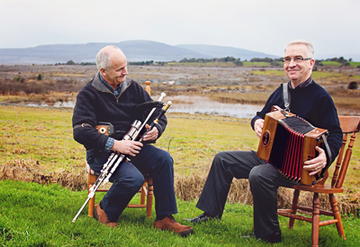 Dunne played the uilleann pipes and fiddle throughout the evening, and along with accompanist John Coyne (originally from Limerick but resident in Boston now) they held the audience spell-bound with their lively craic-filled performance. Dunne was the living embodiment of the impact of the traveling community, one of 16 children living in a caravan outside Limerick while his father Paddy, who taught him all his music, went to races, fleadhs and market days busking music to support his family. O’Connell told and sang of his home place Doolin, of the famed Russell Brothers who helped make it and Gussie Connors’ pub famous. He also told of his own trials and tribulations, first losing his own wife to breast cancer and then nearly losing his own battle with stomach cancer and losing a kidney a year and half ago. But the magical power of the music and dance helped revive him, and he even did a bit of sean nos dancing to prove the point to the amazement of all who attended. As the night drew to a close, O’Connell told us that much of the proceeds from their show would be shared with the Michael Dunleavy Foundation (www.michaeldunleavy.com) in Boston started with a few dollars from a lemonade stand collected by the young eight-year old Michael Dunleavy who succumbed to brain cancer. Since his passing in 2002 it has raised over $2 million for research on childhood cancers. It was an exceptional night of Irish community all around that speaks of the indomitable spirit of the Irish to overcome adversity and to celebrate the rich heritage we enjoy.